I had to go to the grocery store three times last week, mostly to buy eggs. Between the three of us, we ate more than two dozen! I think a lot of it was that Joe worked later in the morning, so he ate breakfast with us. 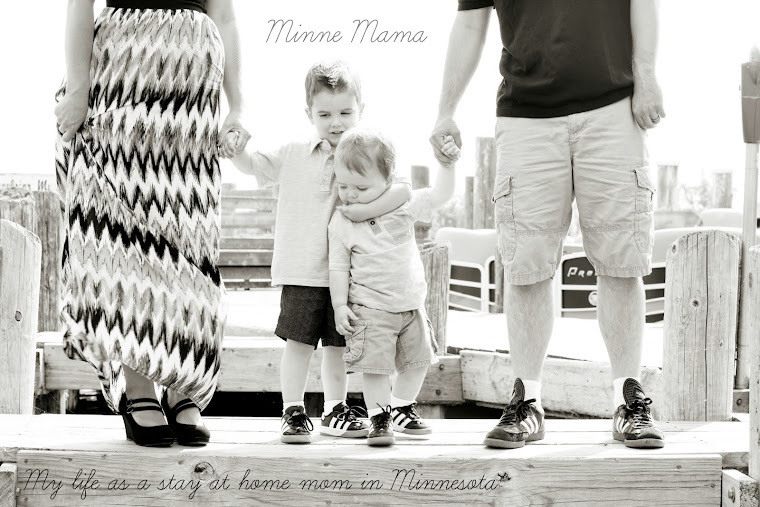 Throughout college, I spent summer break working as a camp counselor in my home town. 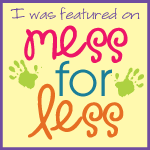 We did two crafts a day, five days a week. 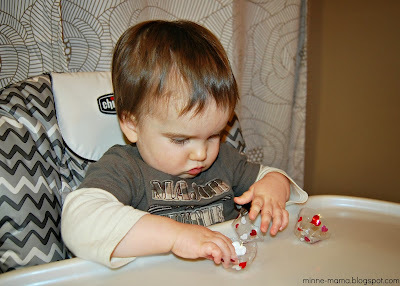 We used a lot of egg cartons for those crafts. I thought about that last week when I realized that the egg cartons I have been buying are now clear plastic and not the brown paper that I have planned so many crafts around. I decided to keep the two empty cartons sitting in my kitchen, determined to find a use for them. 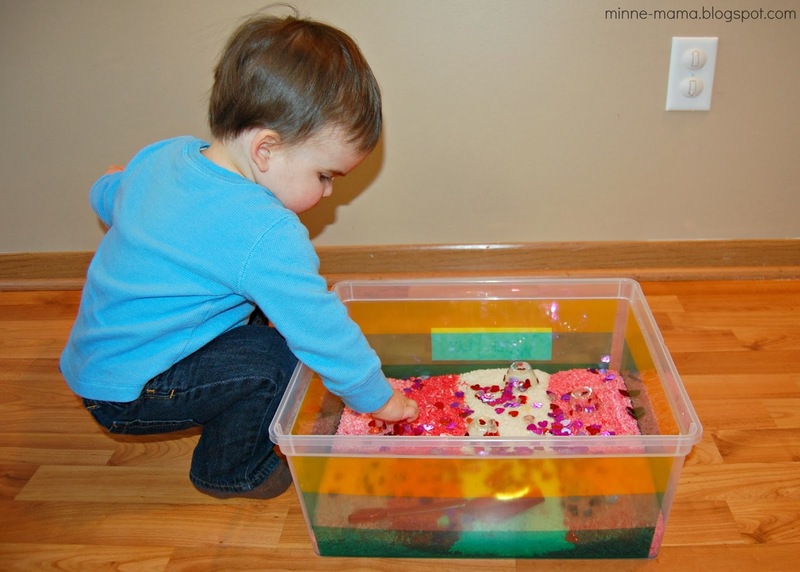 I came up with a lot of ideas for activities with Skyler, mostly skill building and fine motor. 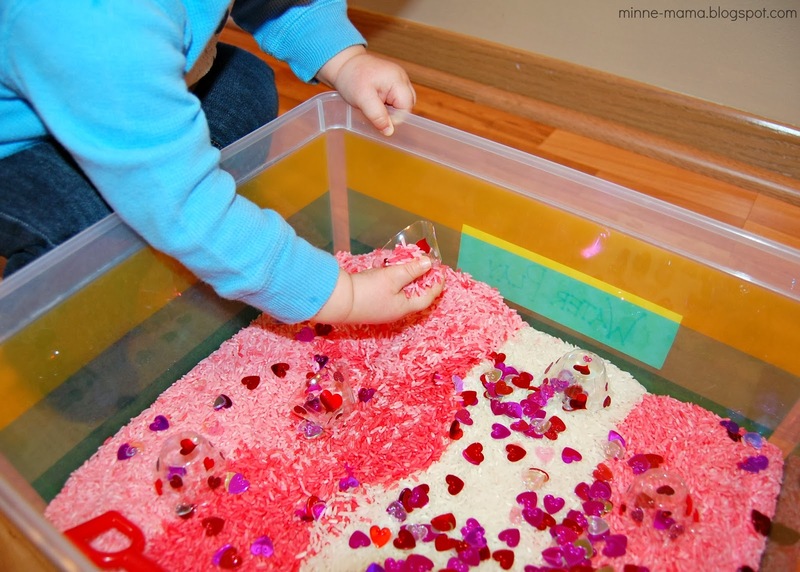 This sensory bin was one of the ideas I came up with. 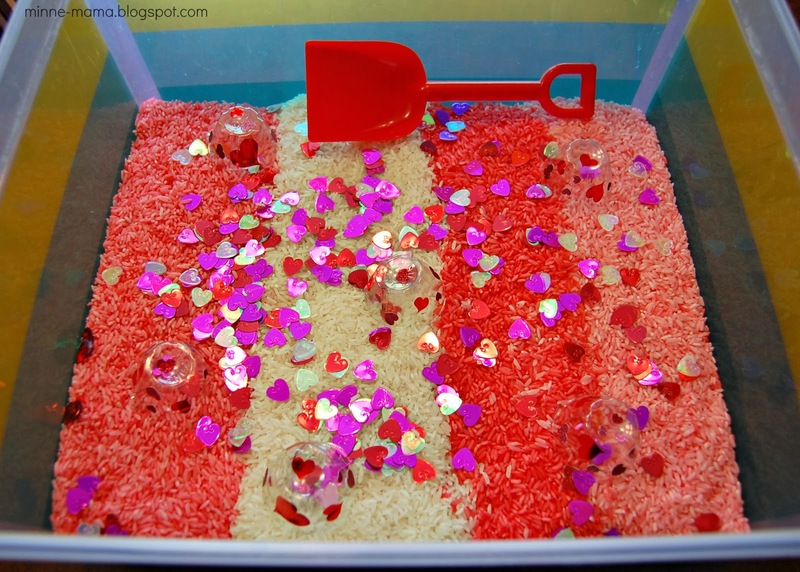 I knew I wanted to make a Valentine sensory bin. 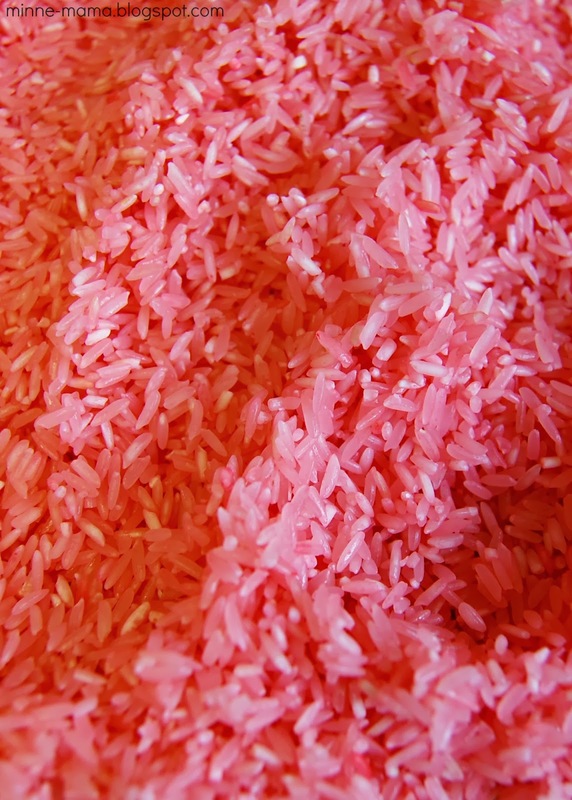 Since we recently did dyed pasta, and it was very popular with my little guy, we went with dyed rice this time! 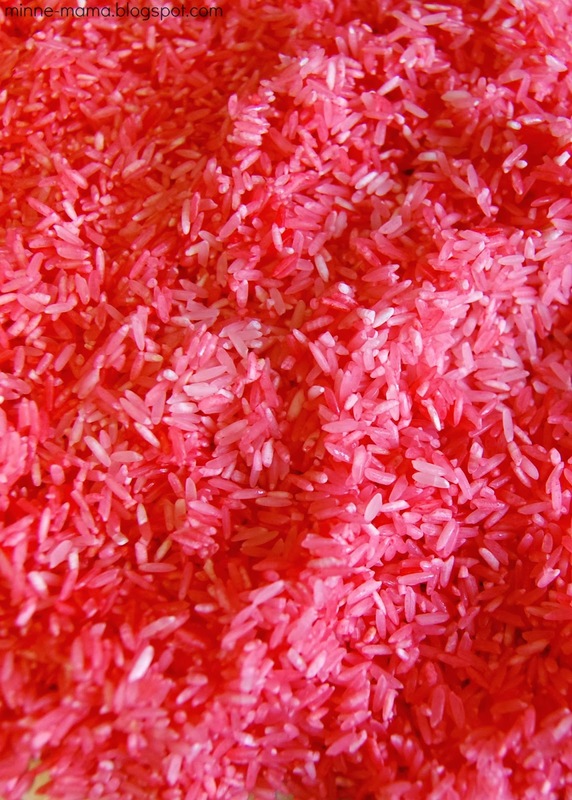 To dye the rice, I used 1 tablespoon of distilled vinegar per cup of rice and added red food coloring until I got the color I liked. 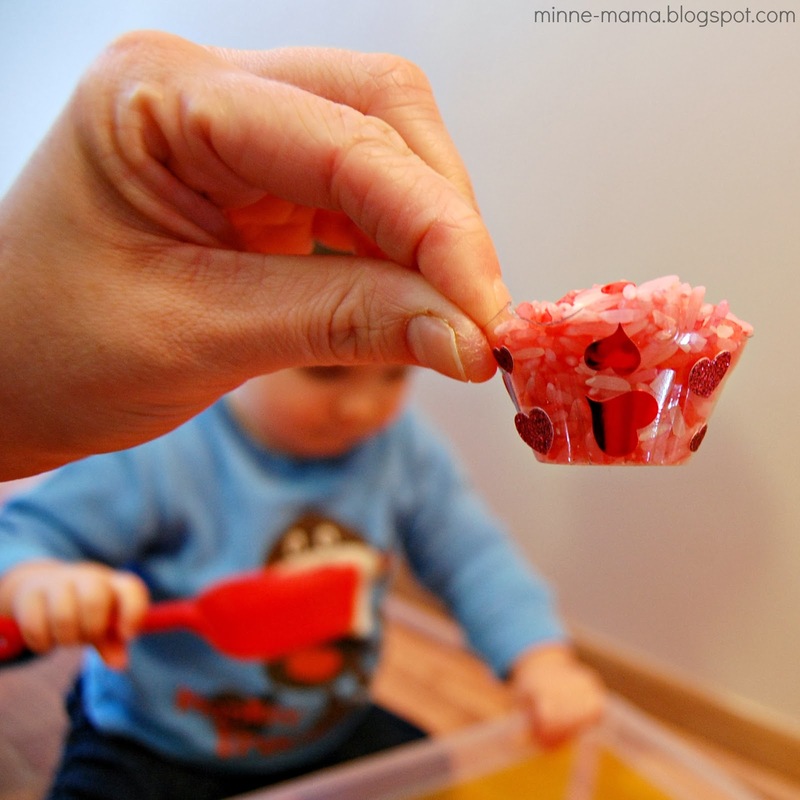 It is a lot of fun and so easy to do. 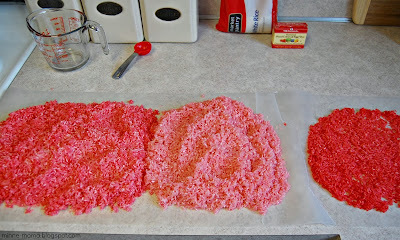 Just throw everything in a large plastic bag, shake it up, and pour it onto wax paper until dried. Skyler will be able to do this by himself before I know it! 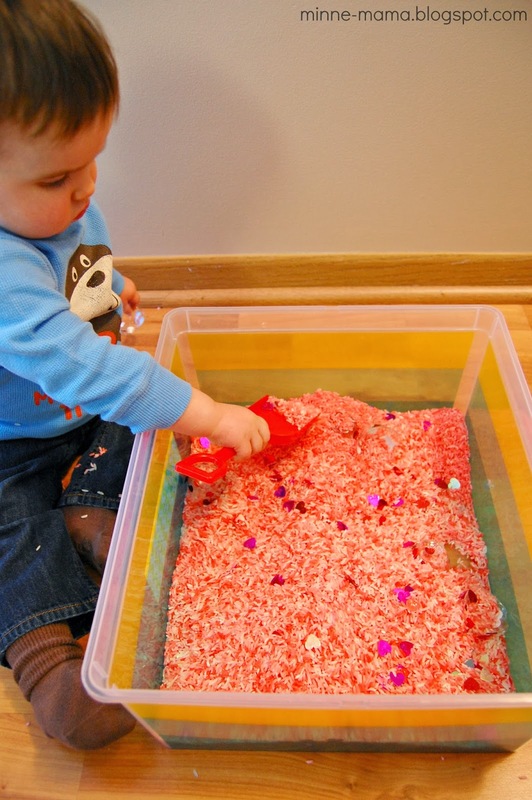 I made three shades of pink for this sensory bin. I made four cups of the middle color, three cups of the lighter color, and only one cup of the dark color. 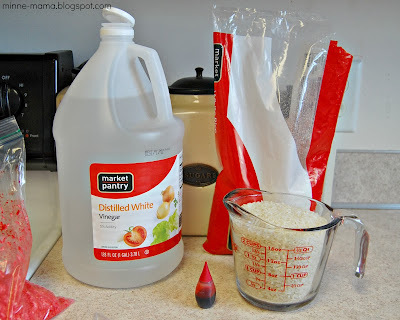 I left the rest of the rice white. 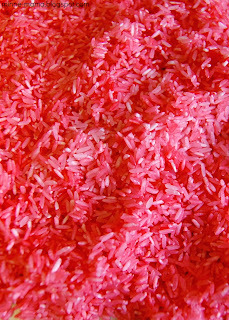 Once it was dry (about an hour) I put them all into the bin. 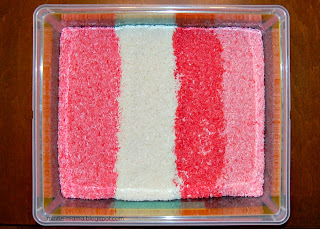 It will be so pretty when Skyler starts playing with the rice and all four colors mix together! 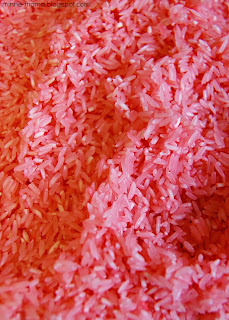 The egg carton inspiration that started the entire craft was making small scoops for the rice. 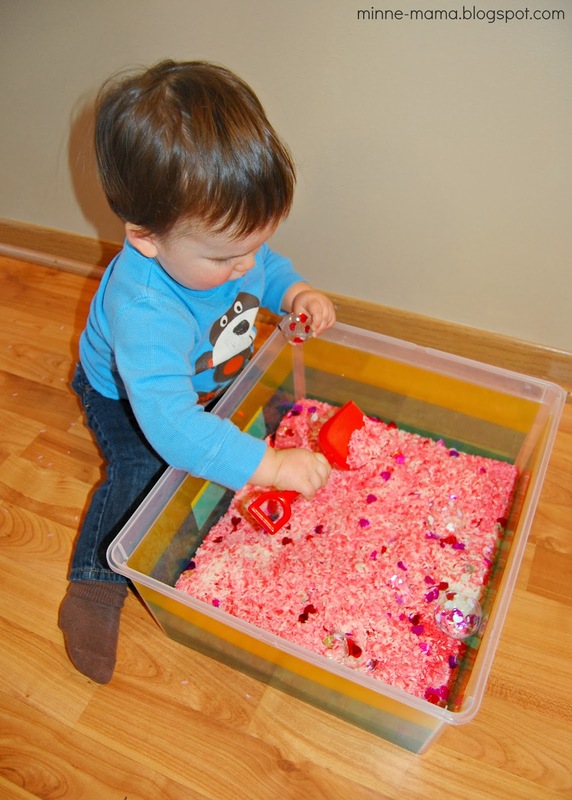 I wanted to use the clear cartons so that Skyler will be able to see the rice through the scoop as he plays. To go along with our Valentine theme, we covered the little cups with little heart stickers. 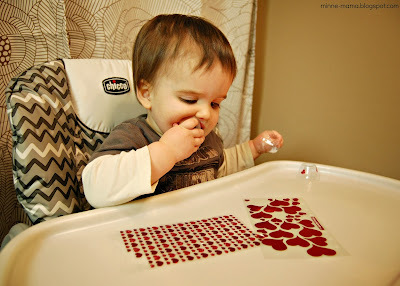 We love stickers! 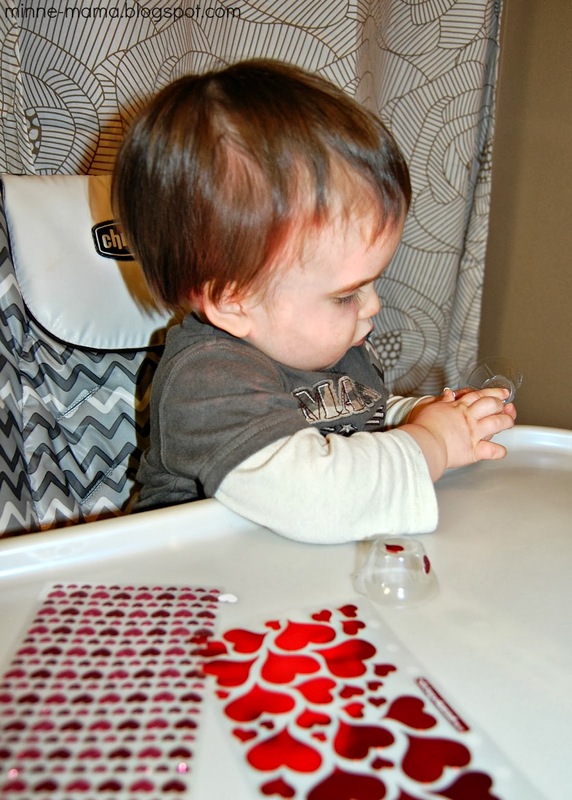 I loved how the shiny stickers created heart shapes on Skyler's face, which can be seen in the first picture! 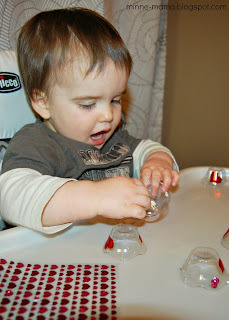 While Skyler did a lot of the sticker decorating, his favorite part of using the cups was stacking them over and over. He played with the cups for over twenty minutes, just stacking them! 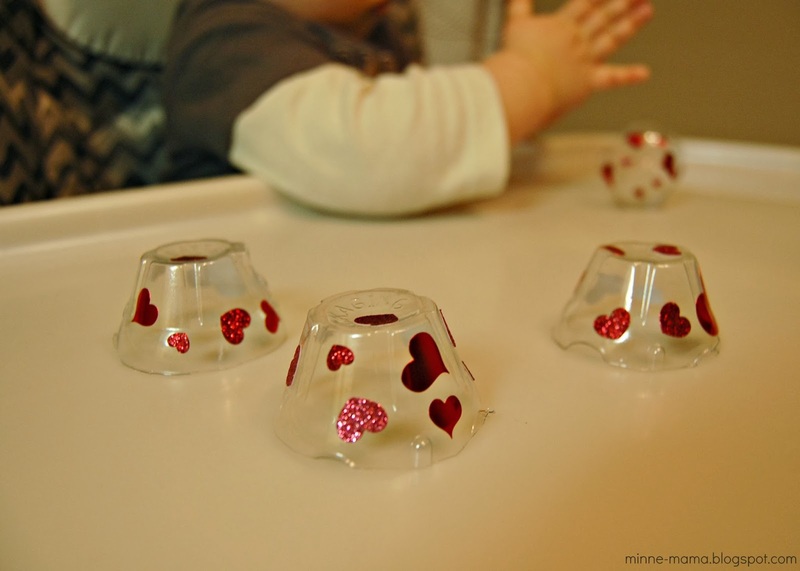 The little cups turned out so cute with the stickers, and they will be perfect scoops for our Valentine themed sensory bin! 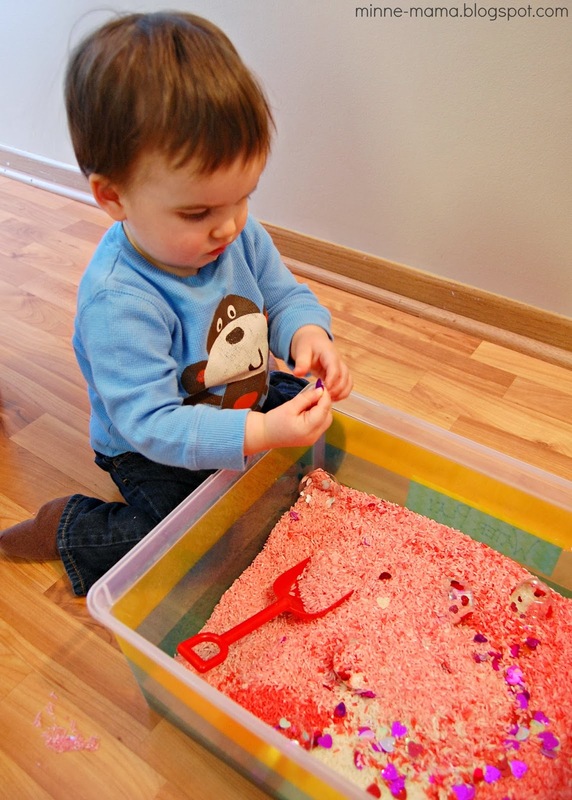 Today before we played with the bin, I added heart sequins, our decorated cups, and a shovel. Skyler saw the bin when he woke up from his nap. He ran up saying "Cups! 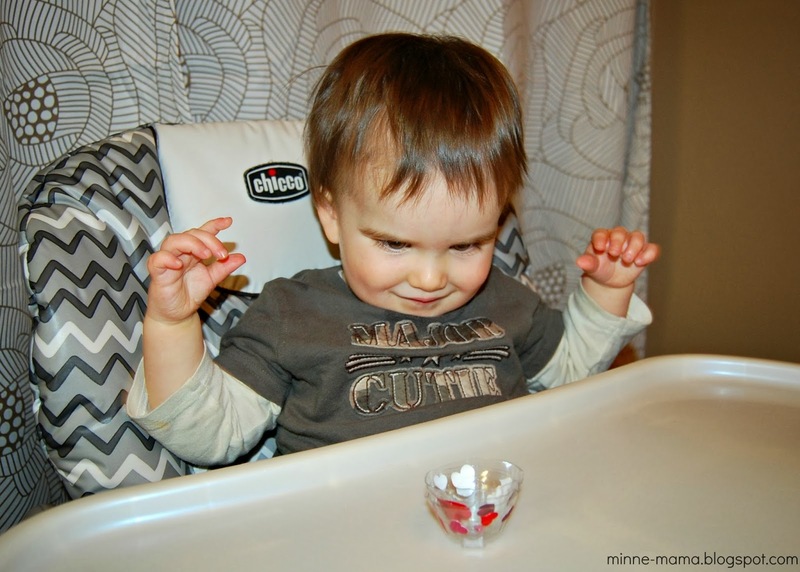 Cups!" 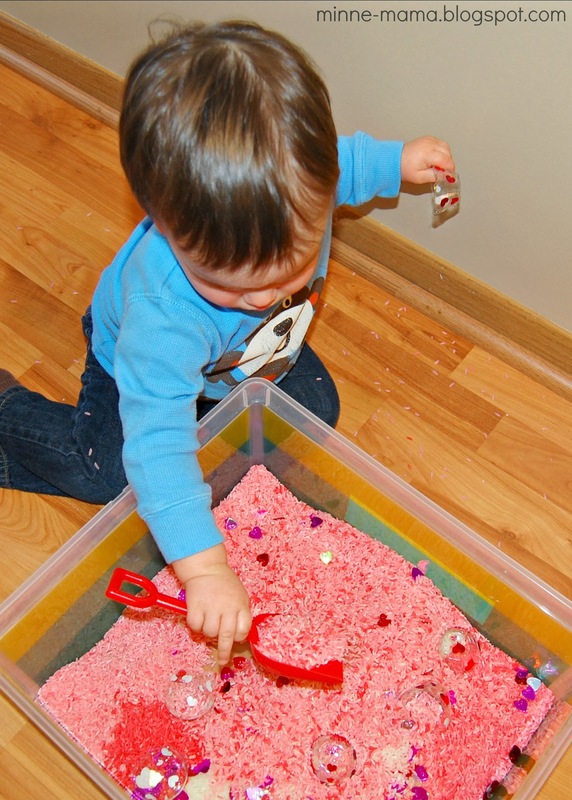 Skyler LOVED this bin! 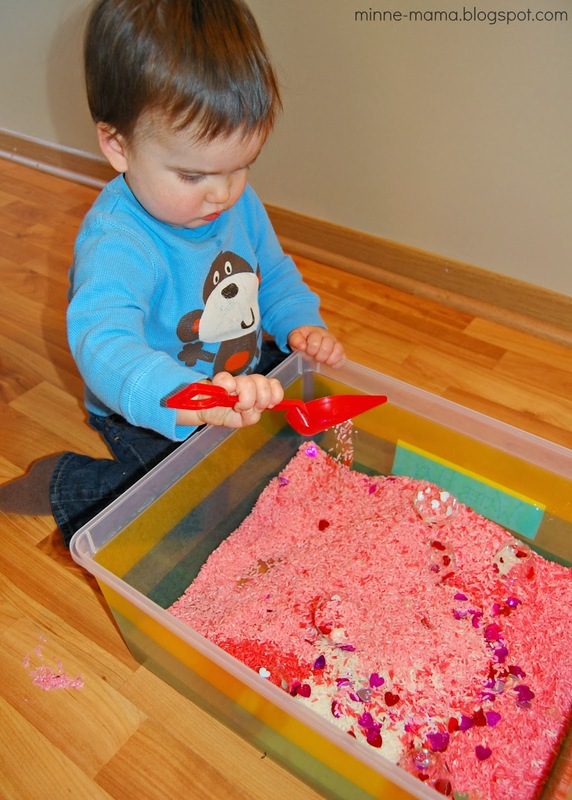 He searched for heart sequins, used his cups to scoop and dump, shoveled rice into the cups, and mixed up all the colors while he played. It was a lot of fun! 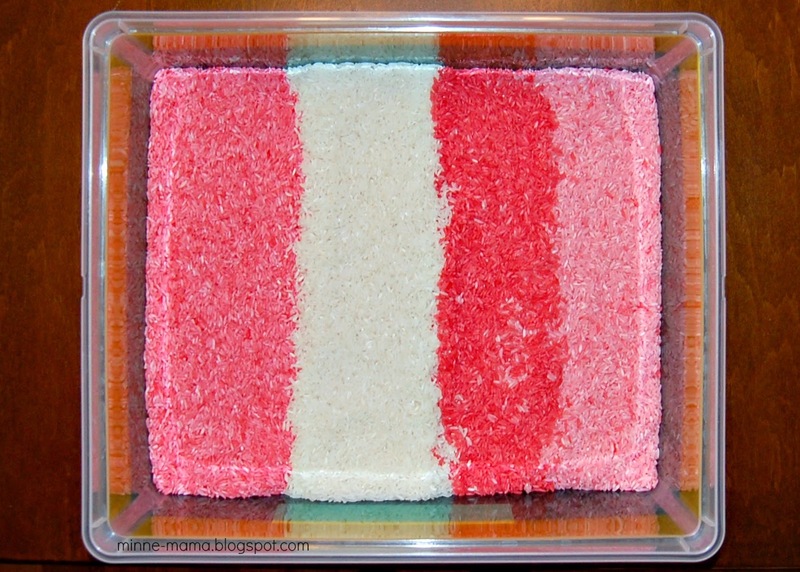 The small cups worked so well with the rice, and the different shades of pink look great in the clear, heart decorated egg cartons! 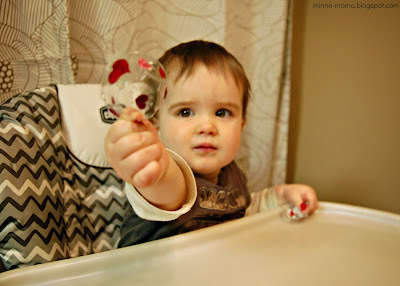 A very festive Valentine bin that baby boy really enjoys equals a happy mama! 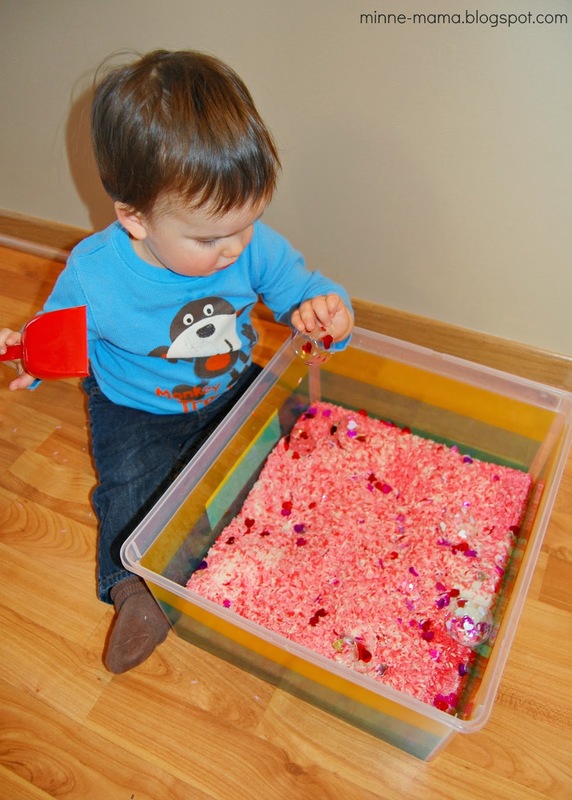 I know we will use this sensory bin often in the next month.